1989-01-06. New. Ships with Tracking Number! INTERNATIONAL WORLDWIDE Shipping available. Buy with confidence, excellent customer service! 1991-01-04. New. Ships with Tracking Number! INTERNATIONAL WORLDWIDE Shipping available. Buy with confidence, excellent customer service! 1989-01-05. Good. Ships with Tracking Number! INTERNATIONAL WORLDWIDE Shipping available. May not contain Access Codes or Supplements. May be ex-library. Shipping & Handling by region. Buy with confidence, excellent customer service! Yale University Press. PAPERBACK. 0300050313 Special order direct from the distributor . New. Yale University Press. Hardcover. 0300044402 New Condition. . New. Yale University Press. PAPERBACK. 0300050313 New Condition. . New. New Haven and London: Yale University Press, 1989. x, 322p., front. map, dj. BATSFORD, 1989. 1ª edicion. . Encuadernacion original. NUEVO / NEW. SAGGS, H. W. F. CIVILIZATION BEFORE GREECE AND ROME. , 1989, x 322 p. laminas Encuadernacion original. Nuevo. 322 pages, binding is tight, text is clean, no marks in or on book, an excellent reading copy. Yale University Press. PAPERBACK. 0300050313 Like New Condition. . Fine. Yale University Press. Hardcover. 0300044402 Like New Condition. . Fine. New Haven: Yale University Press. 1989. First Edition; First Printing. Hardcover. 0300044402 . Very Good in a Very Good dust jacket. Owner ink stamp to FEP. ; 9.40 X 6.30 X 1.40 inches; 322 pages; Original unclipped dust jacket protected by archival Brodart cover. All domestic orders shipped protected in a Box. .
New Haven, CT, and London: Yale University Press. Near Fine in Near Fine dust jacket. 1989. First Edition; First Printing. Cloth. 0300044402 . A gorgeous first edition/first printing in Near Fine condition in alike dust jacket . New Haven: Yale University Press [0-300-04440-2] . (Hardcover) 322pp. Very good plus in very good plus dust jacket. Maps, photographs, illustrations, references, select bibliography, index. (History--Ancient, Ancient Civilizations). Yale University Press, 1989. pp.322 b/w plates clean tight copy. Fourth Printing. Hard Cover. Fine/Fine. 8vo - over 7¾" - 9¾" tall. Civilization before Greece and Rome. New Haven, Ldn., Yale Univ. Press, 1989. (XIII),322 p.; ills., 16 pls. Pb. Yale University Press. Very Good in Very Good dust jacket. 1989. Hardcover. 0300044402 . Dustjacket is protected with mylar. ; 1.4 x 9.4 x 6.3 Inches; 322 pages . London: B. T. Batsford. Fine in Fine dust jacket. 1989. First Edition. Hardcover. 0713452773 . With many illustrations, maps on endpapers, A fine copy in fine dustjacket. For many centuries it was accepted that civilization began with the Greeks and Romans. During the last two hundred years, however, archaeological discoveries in Egypt, Mesopotamia, Crete, Syria, Anatolia, Iran, and the Indus Valley have revealed that rich cultures existed in these regions some two thousand years before the Greco-Roman era. In this fascinating work, H. W. F Saggs presents a wide-ranging survey of the more notable achievements of these societies. ; 240 x 160mm; xii, 322 pages . NEW HAVEN: YALE UNIVERSITY. VG/VG DJ RUBBED, IN MYLAR WRAP. Pages: 322. . 1989. HARDCOVER.. Condition: VG/VG DJ RUBBED, IN MYLAR WRAP. Pages: 322. New Haven, Connecticut: Yale University Press, 1989. Book. Very Good+. Hardcover. American First. A bit of edge wear to boards and dust jacket; otherwise a solid, clean copy with no marking or underlining; collectible condition; illustrated with black and white photographs, drawings and maps..
New Haven, CT, U.S.A.: Yale University Press, 1989 Hardback. Very Good/Very Good. Yale University Press, 1989. Hardback. Fine/Fine. New Haven, CT: Yale University Press, 1989. First printing. Hardcover. Fine/very near Fine. 322 pp. Includes bibliography and index, in addition to several black and white photographs. New Haven and London: Yale University Press, 1989. Book. Very Good. Cloth. 8vo - over 7¾" - 9¾" tall. 322pp., biblio., notes, figures, references, maps, photos. Very light wear..
Yale University Press, 1989-01-01. Hardcover. Used:Good. New Haven: Yale Univ. Press. Hardcover. 1989. 8vo 322pp . Fine in Fine DJ. B&W Illustrations . New Haven, CT: Yale University Press. VG/VG. (1989). ........ Cloth(Hrdcvr). 8vo., 322 pp., cover scuffed, bookplate . New Haven: Yale University Press, 1989. Paperback Octavo. Paperback. Very good. wraps, 322 pp. Yale University Press, 1989. Hardcover. Good. New Haven and London: Yale University Press. NF. 1989. 1st Edition. Hardcover. First Edition. A near fine copy in a near fine dust jacket. Rubs to th e book's corners. Rubs to the dust jacket's corners and to the head an d heel of its spine. .
Yale U. Press, 1989. Later printing. Fine in fine dust jacket, in mylar cover. New Haven: Yale Univ. Press, . 8vo. , 322 pp. Maps, photos. Black cloth, gilt lettrng, w/ d.j. NF/NF. Reprint edition of this wide ranging survey of the ancient civilizations of Egypt, Mesopotamia, Crete, Syria, Anatolia, Iran, and the Indus Valley. Yale University Press, 1991-01-23. Reprint. Paperback. Used:Good. New Haven, CT: Yale U.P., 1989. First Edition. Hardcover. Fine/As New. Size=6.5"x9.5". 25 Plates, 15 Figures,4 Maps. (full book description) Yale U.P., New Haven, CT, 1989. 1st Edition Fine/Fine-, Hard Cover, w/Dust Jacket. Size=6.5"x9.5", 322pgs(Index). 25 Plates, 15 Figures,4 Maps. DJ lightly rubbed, o.w. clean, tight & bright. No ink names, tears, chips, foxing etc. 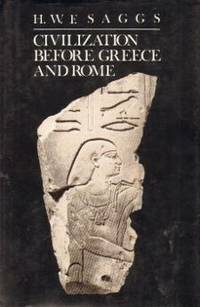 ISBN 0300044402 [Civilizations; Pre-Greek; Pre-Roman; Ancient Cultures; Ancient Peoples; Archaeological Site; Ancient Countries; University Press] SELLING WORLDWIDE SINCE 1987. WE ALWAYS PACK WITH GREAT CARE! New Haven, CT, U.S.A.: Yale University Press, 1989. (4th) Larger book, fine black cloth, bright gilt lettering on spine, 322 lightly browned pages, photo section. DJ background is shiny black, photo of illustrated clay tablet on front and back. DJ has light creases at spine bottom, very tiny tear at top back tip. Fine+ DJ/Very Fine book.. Cloth. Fine/Fine. Yale University Press, 1989. Hardcover. Very Good. No markings. 322 pages. Yale University Press. Hardcover. 0300044402 Like new throughout the book, including the cover. No markings, tears, creases, or stains. The Dust Jacket is in very good condition with some rubbing to the front and back. We hand-pick all of our books with the care of book-lovers :-) They are stored and shipped from a smoke-free environment. Our books are packed well for shipping, ship promptly, and ship with a tracking number. . Very Good. New Haven & London: Yale University Press, 1989. 320 pp., references, biblio, index. Very light wear. DJ: rubbing.. Hb. VG/VG. LONDON: B.T. BATSFORD. Hardcover with photo illustrated dust jacket. Slight wear/rubbing on DJ edges. No printed price on DJ, not price clipped. Blue boards with gilt titles on board spine. Moderate slant to board spine. Pages are slightly foxed. Overall clean, tight pages. Strong binding. No inscriptions. 321 pages with index. History/Archaeology. Pre Greek and Roman civilisations in Egypt, Mesopotamia, Crete, Syria, Anatolia, Iran and the Indus Valley. Black and white photograph ilustration(plates). Location: LXB1 Size: 12mo - over 6¾" - 7¾" tall . Very Good. Hardcover. First Thuis.. 1989. New Haven: Yale University Press, 1989. First edition. Hard cover. Fine in very good dust jacket. A Fine Copy In Near Fine Dust Jacket. Sewn binding. Paper over boards. 322 p. Audience: General/trade.